Miadidas F50: In my opinion, the Seattle Sounder’s home kit is one of the best in the MLS. 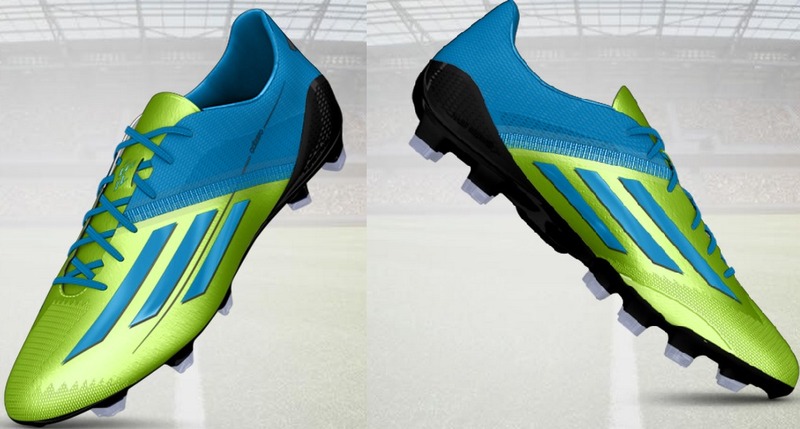 The green and blue design is bright and bold so it deserves a miAdidas just as impressive. My design features a solar slime base and is complimented by solar blue stripes and as a secondary colorway. Miadidas Nitrocharge: The miAdidas design for the LA Galaxy matches up nicely with their away kit. I felt that the dark yellow of the jersey could be emphasized with an electricity energysling and stripes. Of course the primary dark blue of the jersey is also used in the design. The base and quarters are both hero ink, which is very similar to the dark blue of the secondary jersey. Miadidas Predator LZ: The DC United Home kit is a simple but solid blend of black and red with touches of white. Just like the jersey, the boot’s main color is black. Hires red is used as a secondary color and is used for the Lethal Zones 1 and heel area. White is used for the stripes, Lethal Zones 2, and the laces to bring the whole design together. The end result is a simple but exciting blend of black, red, and white. Miadidas Predator LZ: Last season the Impact debuted possible the classiest looking kit the MLS has ever seen (a throw back to their 1994 kits with blue and black stripes and a collar to die for); and it’s those kits which provide the inspiration for this bespoke pair of Adidas Predator LZ’s. With a blue forefoot and black heel portion of the boot, black LZ elements and just a tinge of white on the laces and 3 stripes, you’re left with a boot which would be ideal for occasional set piece maestro Felipe to whip in some big corner kicks while paying homage to the great history of football in La Belle Province. Also they are the only boot which won’t feature the Maple Leaf, and for that you can thank Mme. Marois the current Premier of Quebec. Miadidas F50: Easily the easiest pair of the three to design and that’s because TFC were looking out for me with their club colours of Red, White and Grey. So the F50 featuring the red forefoot, grey heel section and the maple leaf on the tongue of the boot you have a design which would look at home on the feet of TFC’s new DP Jermaine Defoe, who as we all know is a player well known for using his speed to burst past defenders and finish scoring opportunities. Miadidas Nitrocharge: My pet favourite boot from the Adidas collection, and I think I’m alone among the lads on that one. It’s also the boot which I spent the most time playing about with, because technically the Whitecaps are Canada’s oldest club, so they deserve some thought. The blue forefoot represents the waters of the Strait of Georgia, the energysling has been blacked out because it was the only option; three white stripes and the white energy outline represent the sky considering parts of British Columbia are known as Sea to Sky Country. And the ‘Hero Ink’ (purple) mesh heel represents the mountains that populate the province of British Columbia. Also there is the maple leaf representing Canada on the outside heel of the boots. Vancouver is also the team which best suits the Nitrocharge silo in MLS, having been busy in the off season bringing in engine room players like Mathias Laba, and new designated player Pedro Morales. However, if there’s a player I’d love to see careening around MLS pitches in Whitecaps blue and Miadidas Nitrocharge’s it’s young Canadian midfielder Bryce Alderson because if my countries national team fortunes are going to improve our clubs need to play our young players against the best competition they can find. Miadidas 11pro: I absolutely had to make up a boot for my local MLS club team especially since I plan on making many more trips down to Gillette to catch some matches. It is easy coming up with a red white and blue boot but unfortunately the shade of blue is a bit too light to be truly accurate to the kit. Miadidas Predator LZ: I really like watching the Bulls play especially since they acquired Thierry Henry. Though as a Revs fan I have to root against them whenever the two teams clash! I mainly modeled the boots after the club crest but I took inspiration from the Red Bull energy drink can and threw in a dash of blue. Miadidas Nitrocharge: I chose to make up these boots for the Quakes because I favor them in their rivalry with the LA Galaxy. This one I based a little off the Kit as well as the crest but unfortunately there are several predominately blue based clubs in the MLS and my design for the Quakes looks alot like Richard’s design for Vancouver.